Jean Arthur finds herself with two husbands after her first, presumed dead at sea, turns out to be very much alive. The genders are reversed, but the story is very similar to My Favorite Wife, a better film released the same year. 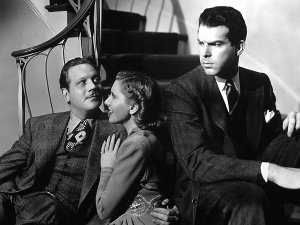 Jean Arthur, Fred MacMurray, and Melvyn Douglas are usually reliable, but I didn’t care for their chemistry. I also had a hard time accepting the conceit that Arthur would actually enjoy pitting the two men against one another, albeit playfully.